Configurable octagonal rings encircle this chandelier for a strong form that’s customizable for each user going from a flat layout to a 3-dimensional shape. Montcalm Collection – The warm colors of the oil-rubbed bronze create an old-style charm and an inviting environment for all to enjoy. Fanton Collection – Chrome frames with LED light inside showcase crystal glass bangles for a distinctively special design. The glass rings add a lightness to its overall style extending its beauty onto its cascading shadows and reflected light. This style combines mixed materials with basic shapes creating a unique look. The Manilow collection – Retro inspired panels of rippled glass shield the orbited candelabra. The tasteful arrangement adds a heightened elegance to any area with the polished chrome trim. A versatile piece, the Manilow can be placed in a variety of settings: contemporary, mid-century modern, traditional, transitional, bohemian, and Hollywood glam. Inspire audiences with your own unique style. Modern take on an Italian classic, the Catalda pendant features a diamond shape pattern that projects the light in a dazzling way. Inspired by 90s crystal decanters, the notched glass adds depth to the geometric shape. This colored glass piece with retro elements makes for the perfect centerpiece over a kitchen island but is versatile enough to be housed in other areas as well. Adding small splashes of color into your space is easier with these colored glass pendants. The Manchester collection – Clear glass enclose opal white lights on a refined crisscrossed framework. This accordion-style family of lights are available with or without finials for a bit of customization. From chandelier to wall sconce, there are multiple application usages. A beautiful balance between natural and man-made materials – Bobina Collection presents natural bamboo sticks suspended between two antique elliptical bronze rings. The perfect marriage between country and chic, the Bobina wields an LED light adding a modern touch. A one-of-a-kind piece sure to attract attention. Make spring feel different by adding a little change on your wall with this unique wall sconce/flushmount light. Irregular shaped with butterfly inspired oval LED rings, this cheerful design adds whimsy to any room setting. The butterfly symbolizing growth and evolution, makes the Olga Collection a great transitional piece, both physically and figuratively. Select from satin gold or silver finish. Let your space bloom! Allow me to introduce to you the Perlina – bold and breathtaking. As winter sets in, the mountain springs are surrounded by icy drama. The designer felt compelled to immortalize that moment when the mists rising into the air crystallize and glitter in the soft light. Allow me to introduce to you the Pratolina – serene and beautiful. Inspired by the quiet grace of a swan on the calm water – elegance of movement and purity of line. 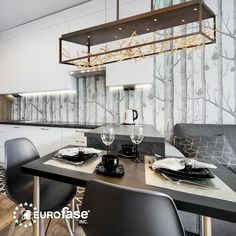 The patterned sanded glass leaves spread out and up, overlapping whimsically from a single polished chrome base representing both strength and fragility with its softly shimmering illumination. Its simplicity of form is an ultimate tribute to nature. Allow me to introduce to you the Padova – dramatic and distinctive. Inspired by the jewels, the silver, the bronze and the crystals of the Russian court in the time of Catherine the Great. 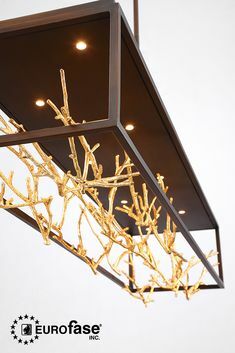 The handcrafted bronze framework spreads its generous double-arched arms from the central cage to the over sized crystal droplets that extend from below magnificent crystal bobeches. Elegant and timeless, the Padova collection illuminates with simple, yet shimmering brilliance. Allow me to introduce to you the Marta – a perfect balance of simplicity and detail. As he approached the centre of the deserted Spanish square, he saw the large marble statue. A woman, renowned for her great beauty. As he walked closer, he looked at the base of the statue – on it a single word – Marta. Allow me to introduce to you the Corso – classical, elegant and infinitely beautiful. Reminiscent of the ancient Via del Corso in historical Rome, dotted with charming torteria’s crowded with patrons – chatting, laughing, enjoying delectable meals and great wines. The traditional oil-rubbed base drops solid and straight to a wood-grained chestnut accent. Bronze-finished arms that lift gracefully upward to hold each light and delicate teardrops. Allow me to introduce to you the Ombrello – captivating and capricious. Inspired by raindrops flowing from an umbrella. The oil-rubbed bronze umbrella-shaped base is draped with magnificent cognac-coloured crystal droplets that cascade in rain-like strands – dazzling and dappled – sparkling with elegant splendour in the downcast illumination of the twin candelabras suspended beneath. Allow me to introduce to you the Mona – classical and elegant. With quiet sophistication, the solid nickel base is suspended from a bold nickel chain, enhanced by the clear crystal detailing at the center. 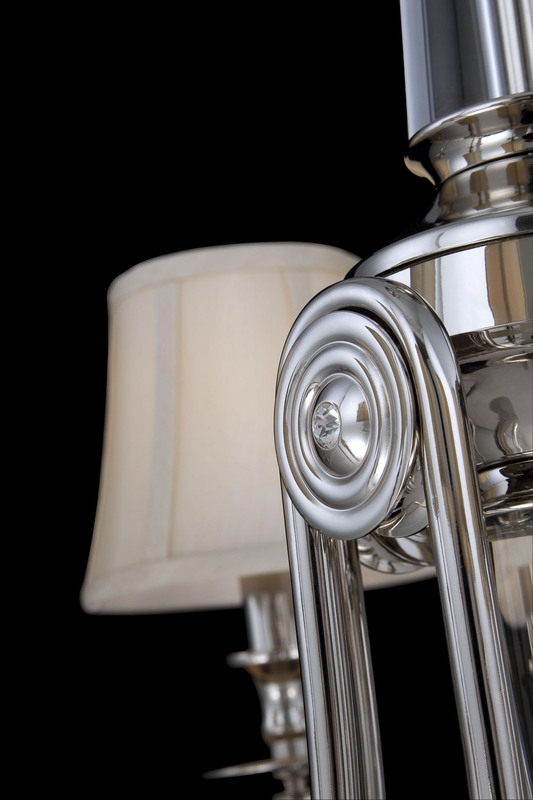 Drama is created by the grand sweep of six polished nickel arms, arching gracefully outward; lifting upward. Magnificent ivory paneled shades capture and transmit the warm and magical glow. To commemorate our 25th anniversary, we wanted to share some of our favourite fixtures over the past years. We polled the office and everyone lent their opinion to help create this post. We all love trends, but sometimes classic is the way to go. 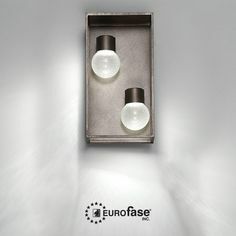 Here are the top picks for the Eurofase Classic Lighting. You work hard at keeping your wardrobe up to date; extend that effort to your décor. Here is a sample of our top picks for lighting trends in the new year. Browse our virtual catalogue for more on trend fixtures. Get your décor white hot with some of our new fixtures. 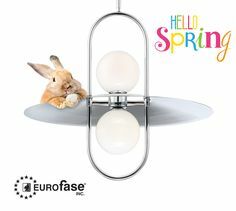 Make your room bloom with style with the new 2013 collection from Eurofase. These Italian inspired pieces are one of a kind and a definite statement of style. A few months ago, we showed you some of our top gothic romantic lighting in the post What’s Old is New: Medieval Lighting. Eurofase predicted this trend continuing and feature some castle worthy fixtures in their 2013 collection. This year we are seeing a lot of natural finishes in fashion and décor, thus we designed more lights to utilize wood in various ways. Add a new texture dimension to your space. The final installment for our Pantone 2013 Color Report blog series features families that include colors and their compliments, giving you options for mixing and matching to create a unique look. Group them together or let them stand alone, whatever you choose will be on trend and perfect for your domain. We all love color, and with the help of Pantone we can keep up with the changing trends for our wardrobe and home. But what if you are not ready to dive into colored lighting? Maybe you want colored wall(s) instead? Here are our top picks for lights that will accent your new, Pantone approved wall color. Continuing with this weeks blog series on the Fashion Color Report for Spring 2013. We are showcasing our POP family, which comes in a variety of colours featured by Pantone. We always love seeing our lights interpreted into different decors and are very happy to share this one with you. This home in Florida used 3 of our Cameo pendants in their dining area. We are loving the open concept of the home and how perfectly the pendants are placed within the whole scheme. 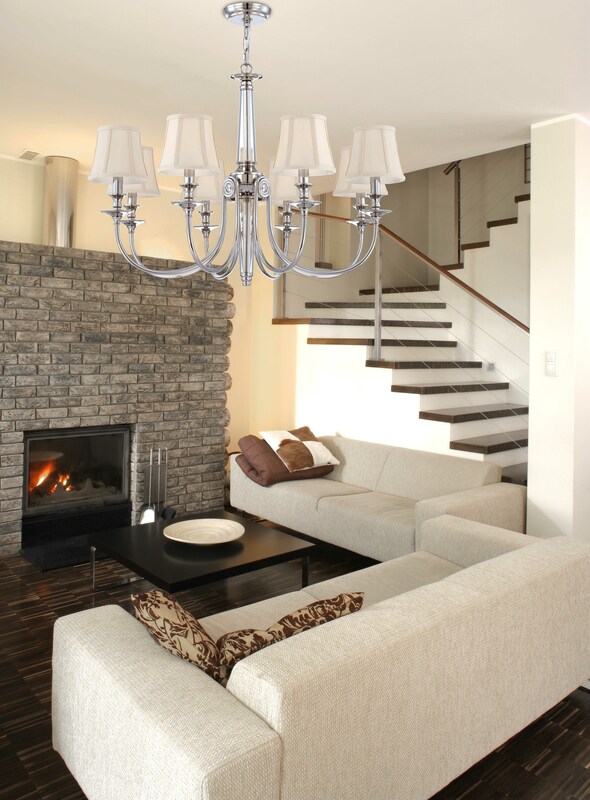 Turn your home into a castle with November’s Fixture of the Month, the Rosini. The Rosini was inspired by the music Yoshino Rossini in 14th century Switzerland among the heroes on horseback riding through their kingdom. 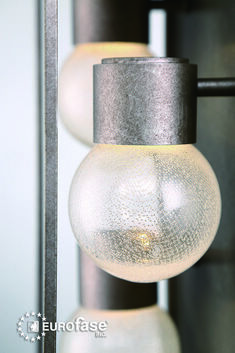 This fixture is strong and beautiful with curvaceous lines and a gunmetal/armor finish. 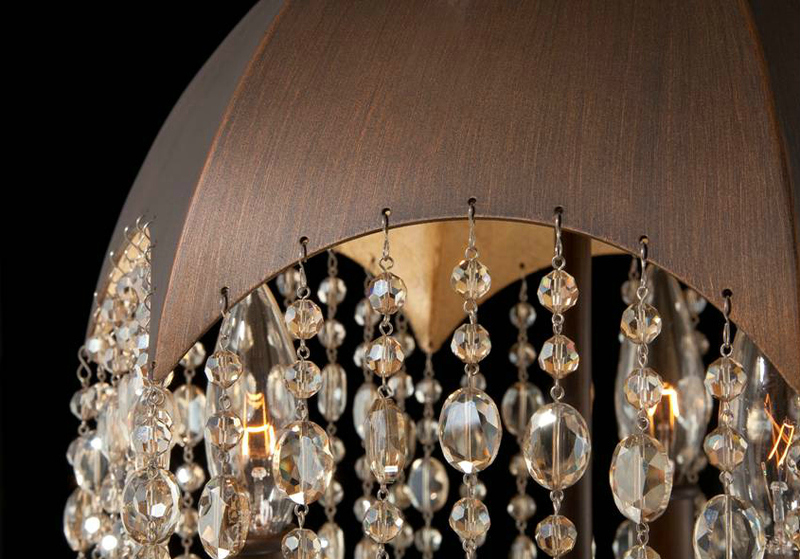 Smoked crystals are suspended within strong classic European lines of the metal frame. Completing the symphony of the well orchestrated fixture is the crystal bobeches holding up candle sticks with candelabra bulbs. Bring the beauty of the outdoors in with the Venetian Collection. Inspired by the rainy season in Venice, the Venetian collection reminds us of glistening diamond raindrops as the rain clears and the sun comes out. A rainfall of hand polished crystals cascade from molded glass arms extending into divine detailed bobeches. The Venetian is a luxurious, handcrafted work of art made of the finest materials. 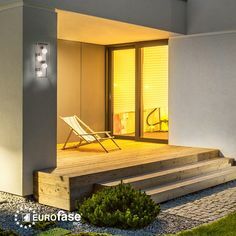 If you are looking to upgrade your home while being sensitive to budget limitations, lighting is known to be an affordable way to enhance the décor, while increasing the value of your home when you are ready to sell. 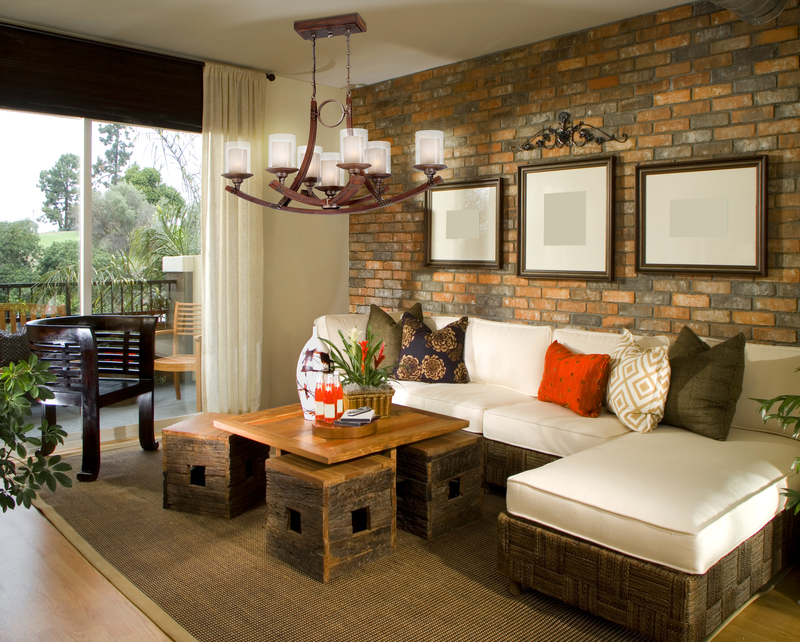 The key is to focus on transitional pieces; fixtures that look good in a number of decors. For the dining room, entry way or living room we selected three standout fixtures that are both contemporary and transitional. 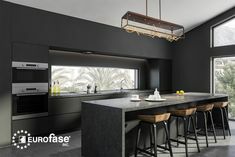 Here at EUROfase, we really like to play with our elements. 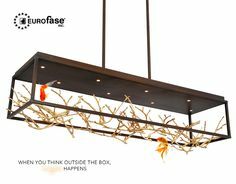 From a wood chandelier, the Lenio, as May’s fixture of the month, to the Aria -a solid chrome piece for June. Chrome is the perfect statement or complimentary colour. This season the Neautrals, Reds, Greens and Blues are the trendy paints, according to Sherwin Williams, and we can see the Aria lighting up any of those colours.